There is a free Scrapinar tonight on a topic that I know will interest most of my readers. Kerri Bradford will present "Die Cuts to Die For." Kerri designed both the Graphically Speaking and the Printing Press Cricut cartridges and she is a popular die cutting designer and instructor. She will be sharing tips that are useful for both electronic and manual die cutting machine users. 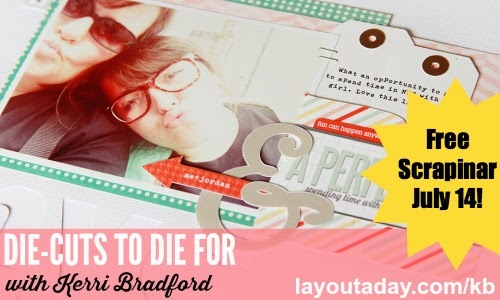 Lain Ehmann of Layout a Day hosts these Scrapinars each month and they are a lot of fun. It you attend live there is a time for questions and answers after the presentation. This month the sponsor is Paper Camellia Scrapbook Kits. The Scrapinar is at 8 p.m. Eastern time. If that time does not work for you, there will be a recording available for a few days but you must register HERE to get on the list to receive the link for the recording. I am planning to attend tonight - I hope to "see" some of you there! Great blog...thanks for the Explore tips, as I'm a new owner...less than a month! Last day of July - last chances!